Synchronous primary tumors account for 0.7%–1.8% of all gynecological tumors. The most common (40%–53%) synchronous primary tumors of genital tract are ovarian and endometrial cancers. Metastasis to urinary bladder in cases of advanced stages of carcinoma endometrium is known to occur, but the simultaneous presentation of these two primary tumors is quite a rare phenomenon. The differentiation of synchronous primary tumor from metastatic tumor is very important as it affects prognosis and management options. Histopathology examination (HPE) plays a vital role in the diagnosis of synchronous primary malignant tumors. Here, we report two cases of anatomically related yet histologically unrelated tumors. More and more reporting of such cases are required to develop effective screening and surveillance protocols for optimum patient management. A 57-year-old nulliparous postmenopausal female had a complaint of generalized vague pain abdomen. On evaluation, she was found to have bladder mass which turned out to be low-grade papillary urothelial carcinoma on cystoscopic-guided biopsy. The patient underwent transurethral resection of bladder tumor (TURBT) followed by three cycles of bacillus Calmette–Guerin instillation. After 6 months of her initial treatment, she presented to AIIMS Rishikesh with a complaint of intermittent hematuria and yellowish discharge per vaginum. The patient was evaluated by the department of urology and gynecology. On detailed history, thorough physical examination and relevant investigations, nothing was found significant except ultrasound sonography (USG) pelvis which showed bulky uterus with heterogeneous hypoechoic lesion suggestive of either carcinoma endometrium or degenerated fibroid. 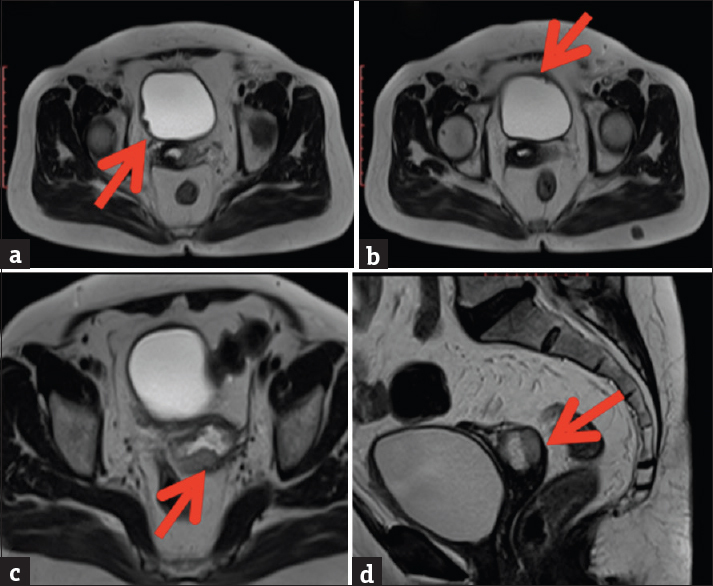 To confirm the diagnosis, magnetic resonance imaging of pelvis was performed, suggestive of carcinoma endometrium [Figure 1], with normal endocervical canal and cervical stroma along with carcinoma bladder [Figure 1] with no extravesical involvement. In an attempt to manage the case in a holistic manner, considering both the uterine and bladder involvement, a restage TURBT along with endometrial aspiration (EA) and endocervical curettage (ECC) was performed. HPE report of EA was suggestive of nonkeratinizing squamous cell carcinoma positive for P40, whereas ECC reported as well-differentiated adenocarcinoma positive for estrogen receptor (ER) progesterone receptor [Figure 2]. These EA and ECC reports were quite unusual. Moreover, further, the TURBT chips reported as low-grade papillary urothelial carcinoma without muscle invasion [Figure 3], stage T1A3 positive for uroplakins. These HPE reports were presented to us as a diagnostic dilemma. The exact diagnosis of underlying malignancy was difficult to make and to choose an appropriate management option was a challenge for us. The case was discussed thoroughly at institute's tumor board meeting among the department of gynecology, urology, pathology, radiology, and radiotherapy. A decision of total abdominal hysterectomy (Type I) was taken. Patient and her relatives were counseled and consented for the procedure. They opted for conservative management for carcinoma bladder as they did not wish to go for radical cystectomy. Cystoscopy and guided fulguration of bladder tumor followed by exploratory laparotomy with ascitic fluid cytology with total abdominal hysterectomy with bilateral salpingo-ovariotomy and bilateral pelvic lymphadenectomy were performed. On cystoscopy, 4–5 small polypoidal growth was seen over the dome of bladder. Intraoperatively, minimal ascites (50 mL) was found, uterus was atrophic and mobile, cut section revealed a 4 cm × 3 cm necrotic, friable growth over lower uterine segment, bilateral ovaries were atrophic, and pelvic lymph nodes were not enlarged. 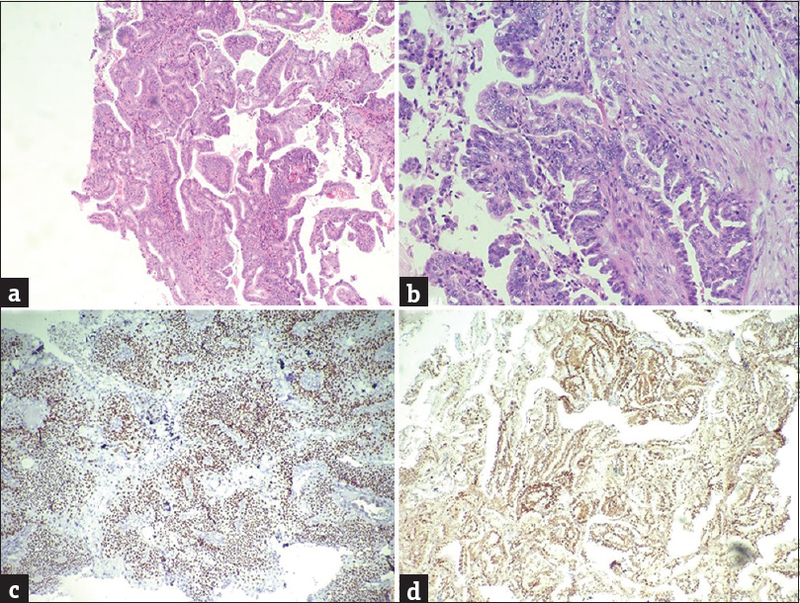 HPE reported as endometrioid adenocarcinoma with focal micropapillary pattern of the endometrium with less than half of the myometrial invasion [Figure 3]. The same endometrioid adenocarcinoma was involving the cervical stroma. Bilateral tubes and ovaries, and pelvic lymph nodes were free of tumor. The final diagnosis of endometrioid adenocarcinoma of the endometrium Stage II along with urothelial carcinoma of the bladder stage T1A3 was made. Postoperatively, the patient received adjuvant chemoradiation and under remission till now. A 55-year-old, para 6, postmenopausal woman presented with on and off postmenopausal bleeding, and lump in lower abdomen for 4 months and foul smelling discharge per vaginum for 1 year. She also gives a history of loss of appetite for 4 months, no history of weight loss, any bladder or bowel complaint, or any hormonal pill intake. Abdominal examination revealed a 12 cm × 10 cm firm to hard, nontender mass in the left iliac fossa. Vaginal examination suggested the same mass in the left adnexa with bulky uterus. Abdominal USG and contrast-enhanced computed tomography abdomen and pelvis showed bulky uterus with thickened endometrium with a large (11.7 cm × 10 cm × 12.8 cm) solid cystic heterogeneously enhancing mass lesion in the left adnexa. EA HPE reported as endometrial adenocarcinoma. Tumor markers were raised (CA 125 - >600 U/L, CEA - 7.8 ng/ml, and CA 19.9–267.26 U/ml). Considering both ovarian and uterine malignancy with no idea of the primary tumor, an exploratory laparotomy with ascitic fluid cytology, total abdominal hysterectomy, bilateral salpingo-ovariotomy, infracolic omentectomy, and bilateral pelvic lymphadenectomy was performed. Intraoperatively, ascites (1.5 L) was present, uterus was of 6-8 weeks in size with a 4x3 cm endometrial growth, 15x10 cm lobulated solid cystic mass arising from left ovary [Figure 4]. Ascitic fluid cytology was positive for malignant cells. The final HPE [Figure 5] revealed a diagnosis of synchronous independent primary malignancies arising from endometrium and ovary. Endometrioid adenocarcinoma of endometrium Stage 1A, Grade 3, and endometrioid carcinoma of ovary Stage 1c, Grade 1, both of the tumors were immunopositive for ER and immunonegative for p53, CD10, smooth muscle actin, and vimentin. As both of them were early stage tumor, with different grades and the intervening structures such as myometrium and Fallopian tube More Details were free of tumor, suggest the diagnosis of synchronous primary tumor of endometrium and ovary. The patient received adjuvant chemoradiation and currently in remission, on regular follow-up. Ulbright T and Roth L proposed the pathological criteria for synchronous gynecological tumors. They suggested either the tumors must have a different histopathological origin, or they should fulfill all the minor criteria (tumors must be restricted, no distant metastasis, no connection between the tumors, no lymphovascular tumor emboli, and no myometrial invasion). In the present case, the diagnosis of synchronous malignancy was made on the basis of different histopathology of both the tumors. Immunohistochemistry and DNA flow cytometry also have some role for the differentiation between primary and metastatic tumors. The exact etiology of this simultaneous presentation is still unknown. There are few hypothesis postulated in the literature regarding its origin. These tumors may arise because of the treatment of another malignancy or may be a part of any syndrome, or they might share common etiologic factors, such as the same environmental factors or genetic predisposition. Tissues of a common embryologic origin of female genital tract, when exposed to certain carcinogens simultaneously, may develop synchronous tumors or these tumors might originate in metaplasia occurring in histologically similar epithelium of the genital tract and peritoneum. The same embryological origin of both urothelial and endometrial tissues might justify the origin in our case. In addition, primary tumors can also be a matter of chance. Usually, synchronous tumors have lower grade, better prognosis, and survival rate when compared to a metastatic tumor. The differentiation between the two is important to determine optimal adjuvant treatment. Mostly, the diagnosis made only after surgery with final histopathology report. As these tumors usually diagnosed in early stage, follow-up is required in most of the cases or else adjuvant chemo or radiotherapy is to be given, whereas metastatic tumors always need adjuvant chemoradiation. The most common histological type of endometrial carcinoma is endometrioid adenocarcinoma. 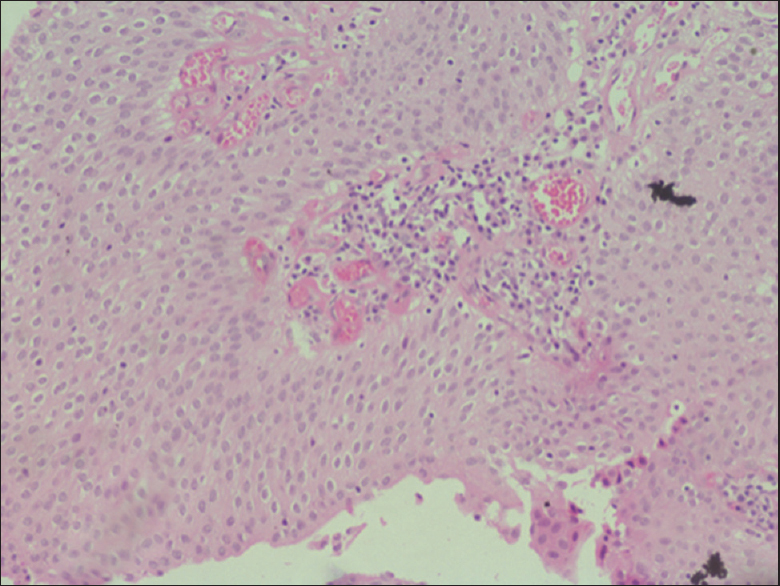 Sometimes, squamous differentiation occurs in endometrioid adenocarcinomas. This might justify the presence of squamous cells in endometrial tissue in the present case. On literature review, apart from synchronous presentation of carcinoma ovary and endometrium, few cases of cancer ovary and cervix, endometrium and cervix, and ovary and fallopian tube are also reported. The maximum number of affected pelvic organs in a synchronous gynecological malignancy reported is five (ovary, bilateral tubes, endometrium, and cervix). Only two cases of synchronous bladder and endometrial tumor are cited in the literature to the best of our knowledge. 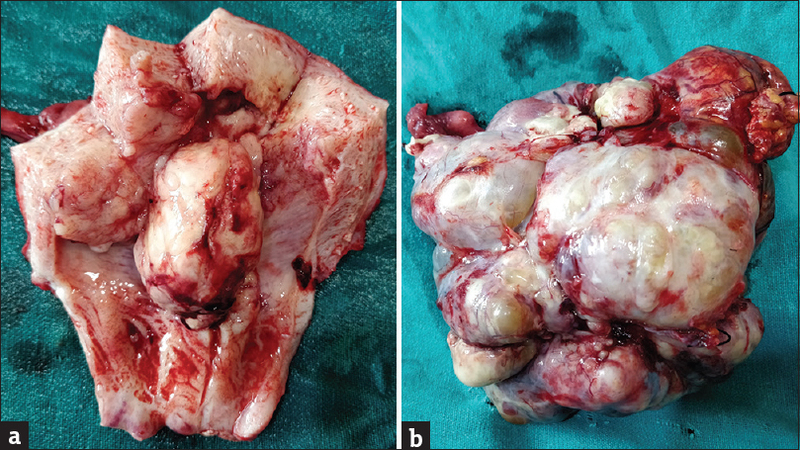 Kim and Park reported a case of double primary cancer of early-stage endometrial cancer along with poorly differentiated carcinoma of the bladder. Yasuhiko et al. reported a case of synchronous triple tumors comprising granular cell tumor of the bladder, endometrioid adenocarcinoma with squamous differentiation, and endometrial stromal sarcoma. The differentiation of synchronous and metastatic tumors is important as it affects tumor staging and prognosis. A multidisciplinary team and patient-oriented approach are the key to successful management and increase in life expectancy of the patient in synchronous primary malignant tumors. Gungor T, Kanat-Pektas M, Ustunyurt E, Mollamahmutoglu L. Synchronous primary tumors of the female genital tract: A single center experience. Arch Gynecol Obstet 2009;279:667-72. Ulbright TM, Roth LM. Metastatic and independent cancers of the endometrium and ovary: A clinicopathologic study of 34 cases. Hum Pathol 1985;16:28-34. Atasever M, Yilmaz B, Dilek G, Akcay EY, Kelekci S. Synchronous primary carcinoma in 5 different organs of a female genital tract: An unusual case and review of the literature. Int J Gynecol Cancer 2009;19:802-7. Takalkar U, Asegaonkar BN, Kodlikeri P, Asegaonkar S, Sharma B, Advani SH, et al. An elderly woman with triple primary metachronous malignancy: A case report and review of literature. Int J Surg Case Rep 2013;4:593-6. Kan O, Alkilic A, Turgay B, Gemici A, Atabekoglu CS. Triple synchronous malignancies in genital tract; primary endometrial, ovarian and fallopian tube carcinoma: A case report. J Clin Diagn Res 2017;11:QD01-2. Kim SA, Park DC. 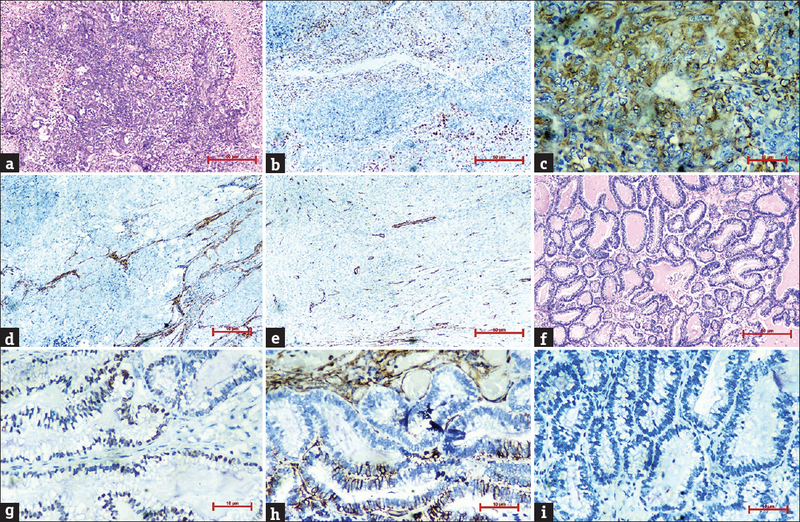 A case of double primary cancers of uterine endometrium and bladder with unusual histology. Korean J Obstet Gynecol 2011;54:543-7. Wood ME, Vogel V, Ng A, Foxhall L, Goodwin P, Travis LB, et al. Second malignant neoplasms: Assessment and strategies for risk reduction. J Clin Oncol 2012;30:3734-45. Yasuhiko K, Masashi Y, Tomohiko M, Katsuaki M, Reiko T, Naoto S, et al. Synchronous granular cell tumor of the bladder, endometrial carcinoma and endometrial stromal sarcoma. Asia Pac J Clin Oncol 2006;2:64-7.